Almanzo: The Almanzo bus conversion - Part 1 - Finding the right bus. 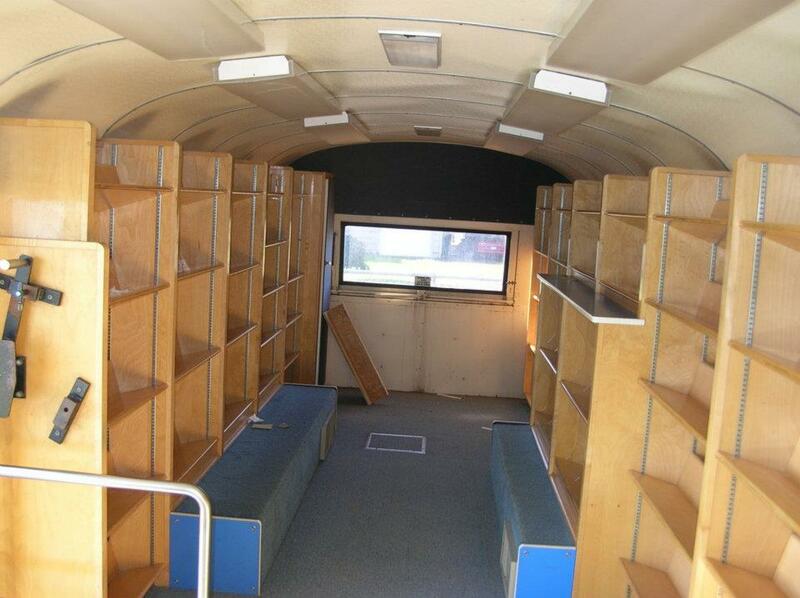 The Almanzo bus conversion - Part 1 - Finding the right bus. So here it is! Part one of four of a series documenting my bus conversion. Back in 2012 I finally found the right bus, after browsing Craigslist and looking at online auctions for over a year. Perhaps I should mention that I had already bought a school bus in 2011 and started on the conversion by removing all the seats and flooring. But I ended up selling that bus as it wasn’t the right bus for my needs. So what is the best bus for a conversion? Well this really depends on your needs and what you plan on doing with your bus once it’s converted. 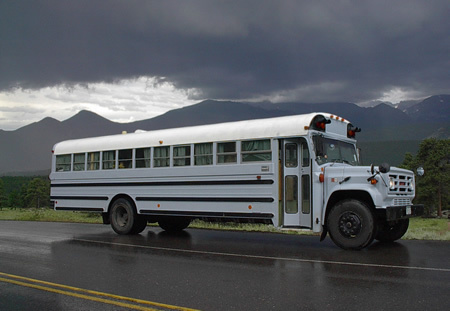 If you just plan on traveling by yourself, don’t have too much stuff and want to keep fuel costs as low as possible, a small/mini school bus, often called a short bus, might be perfect for you. 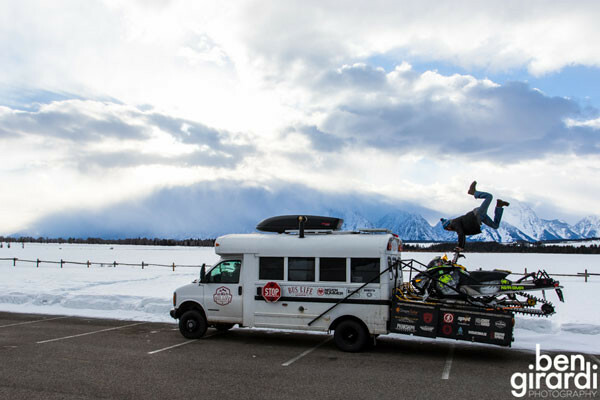 I really like what these guys at Bus Life Adventure did with this Ford E350 bus! The Bus Life Adventure bus. (images used with permission). On the other hand, if you plan on just parking your bus somewhere and living in it without driving it, or if you need room for multiple people a 40ft school bus might be a better option for you. 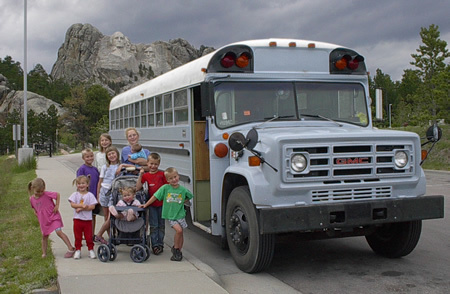 These guys at the Jeub family did a great job converting this bus and used it for their family of 11!. Their blog has lots of info on the conversion too. 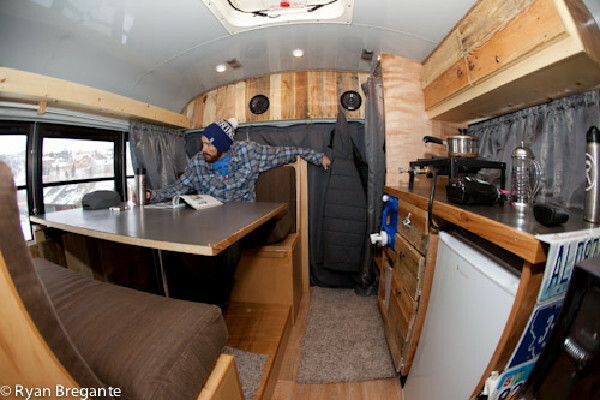 Another cool 40ft bus conversion I came across on the tiny house blog is this one. The Jeub family bus. (images used with permission). As for me, I wanted something that was big enough for me to comfortably live in but not too big that it would be too much of a hassle finding parking spots and driving it on smaller roads. I have thought about just doing a van conversion or even buying an older chevy camper van. This option would have been much cheaper and easier but being 6'7" and living in a van for more than a few weeks at a time just didn't seem like too much fun. So I decided I wanted a bus instead. I also really liked the idea of being able to build it exactly the way I wanted it instead of just buying a used RV. Another reason I didn't like RV's is because they are very expensive to buy and the majority, in my opinion, are build very poorly and won't hold up well during extended travel and full time living. School buses on the other hand are build super heavy duty, just like semi trucks, and will last much much longer than a standard RV. I also always had this dream of one day buying some land and building a log home on it, so i figured doing a bus conversion would be good practice and I can even use it to live in while building a house, if I end up doing that one day. So for about a year I looked at peoples blogs and read as much as I could about school bus conversions while checking Craigslist and auctions at least every week. Medium size busses are much harder to find than either a short bus or 40ft bus and a lot of busses I looked at at where either too expensive, had a lot of rust or needed mechanical work. So I was very excited when I saw an auction in Oregon for this bus! 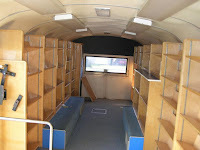 Not only was it the perfect size it also already had an RV style door and two front seats, unlike your standard school bus. Another benefit was that it came with a generator and it wasn't yellow, which I have read is illegal in some States when the bus is no longer used as a school bus. The bus was about a full day's drive away from me, but if you are going to buy a bus at an auction I definitely recommend looking at it before you buy it as they are sold "as is" and they often aren't in as good a shape as they appear to be in the description or the description is really short giving you very little info. 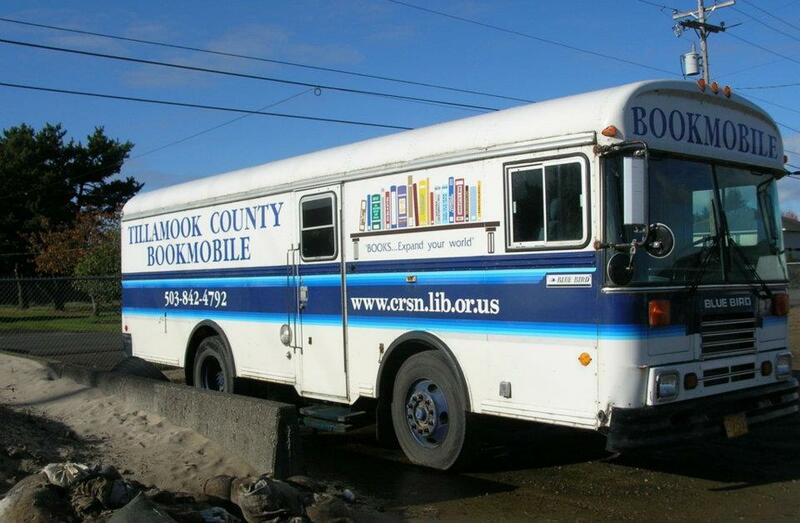 This bus, which was used by Tillamook County as a bookmobile, definitely needed some TLC and had a lot of miles on it but it had nearly no rust and the engine and transmission seemed in good condition, which to me where the most important. I ended up winning the auction with my last and final bid and I think I got a pretty good deal and the bus made it all the way home to Washington without any problems. Besides finding the right size bus, there's a few more things you should know and consider if you're thinking about doing this. I don't want to discourage anyone, in fact I hope to inspire others to take on a project like this, as I had a lot of fun doing it and even more fun traveling and living in my bus. But let's just say it's not easy and it's probably not the best option for everyone. Licensing, registration and insurance can be a real hassle! Until your bus is converted to a motorhome, it is considered a commercial vehicle. Please make sure you check your State's regulations before buying a bus! I can't really give you any advise on this as regulations vary widely from State to State and with the recent increased popularity in bus conversion, regulations are becoming more strict, especially getting your bus insured can be really hard. I've read multiple stories about people that bought a bus only to find out they could not get insurance for it and ended up selling it. In most cases you can NOT get insurance on a bus unless you have a CDL and are getting (expensive) commercial insurance or until your bus is fully converted and the title is transferred to show that it is now a motorhome/RV. Some States, such as WA, sell trip permits which allow you to move a otherwise un-registered vehicle on the public roadway. I used this to drive my bus home and then parked it on my private property until I at least partially converted the bus to the point where it met the State requirements for motorhome registration. If you live in a city, make sure you check the parking regulations as parking an unregistered vehicle or parking a commercial vehicle is often not allowed. A good website with lots of info on bus conversions is www.skoolie.net Besides lots of blogs of people that converted busses, this website has a lot of info on regulations and insurance. One more thing to consider is if the bus has a gas or diesel engine. There's a lot of pro's and con's for either but the main thing you should know is that gas engines are much cheaper to buy and maintain but diesel engines will get twice the milage and last on average 3x as long. Even a 40ft diesel bus will still average about 10mpg whereas a 25ft gasoline engine bus will only get about 3-5mpg. This is the main reason I ended up selling my first school bus I bought in 2011. I only paid $1100 for it but it had a gas engine and I found out that driving it long distance was just not feasible unless I won the jackpot. It would have been great for someone wanting to park a bus somewhere permanently though. If you are considering a bus conversion please check back here soon to read (and see) all about how I turned my bus in to the perfect motorhome in part 2 & 3. I hope you found this info helpful and if you have any questions or comments please feel free to contact me!